Holiday Party? Graduation? Anniversary? Getting married? Or know someone who’s engaged? Or perhaps you want to throw a baby or bridal shower for someone special? Let The Big A Grillehouse host your next event! Our wide ranging menu has something for everyone. 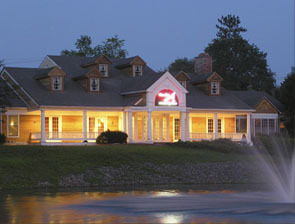 The Best Steakhouse & Italian Restaurant in the Poconos is the perfect choice. Our Private Event Rooms are available for your next special occasion, be it family, social or business. Specializing in American and Italian cuisine for both small and large parties, we offer sit down options or chef prepared buffet complete with carving station. We have four private event rooms with seating ranging from 15 to 90 plus. Our Banquet room has a dance floor, adjoining rooms and courtyard. Murder Mystery Luncheons or Dinners available for groups of 20 or more. We look forward to working closely with you to create the perfect menu for your occasion and your wallet.